9 Easy Savory Pumpkin Recipes You Are Going to Want to Try! 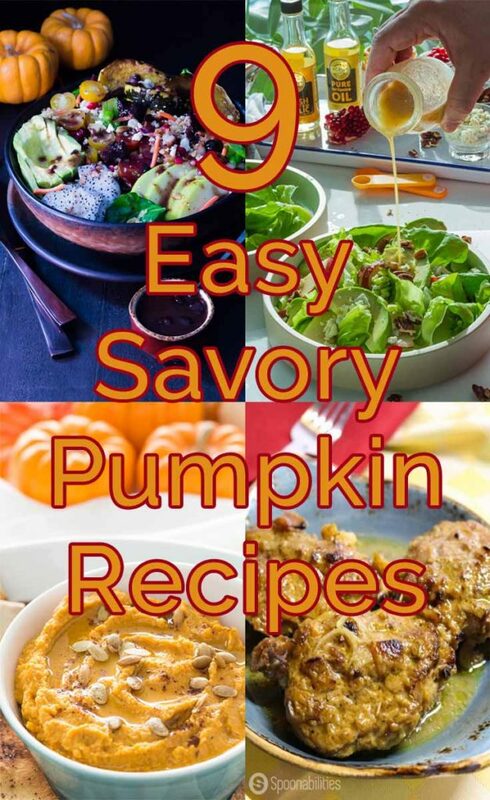 Home » 9 Easy Savory Pumpkin Recipes you will want to try! Now that autumn is under way, we are eager to share some of our favorite easy savory pumpkin recipes including appetizer, main course and side dish recipes that will help you celebrate the season and all its festivities! And as promised last week, we have put together a list of recipes that are not only jammed packed with pumpkin flavor, but that you can put together in as easy as 1-2-3. If you’re like us, (obsessed with everything and anything pumpkin), you are going to love these recipes. We hope you enjoy them as much as we do! Pumpkin Honey Mustard Vinaigrette is what brings all the flavors of fall together in this Roquefort Pear Salad. The vinaigrette is so sweet, so fruity, so tangy, and since it’s a salad, it’s so healthy! 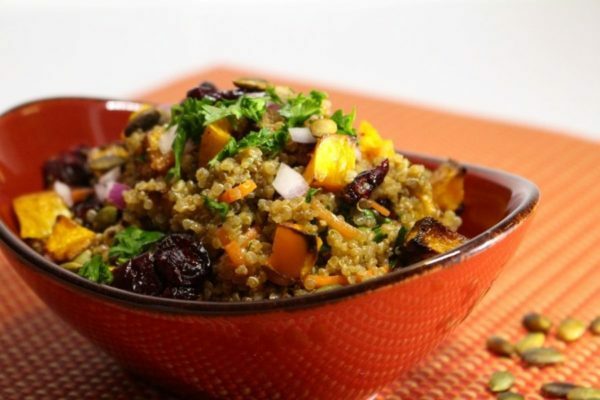 This is a terrific recipe for Quinoa Salad that includes Roasted Butternut Squash and Pumpkin Honey Mustard Vinaigrette. It is perfect as a fall-inspired side dish or main salad. 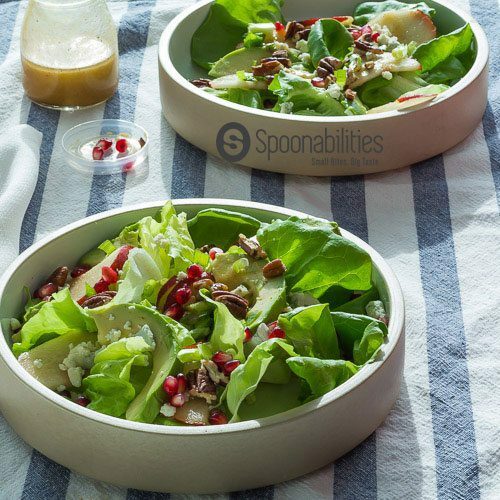 The Cherry Vinaigrette Dressing is fruity with small pieces of Sour Cherry combined with Pumpkin Honey Mustard and Garlic Cottonseed Oil, which help create the perfect balance between sweetness and acidity. This is such a delicious dressing. We suggest buying fresh produce from your local farmer’s market to fully enjoy autumn’s bountiful harvest. 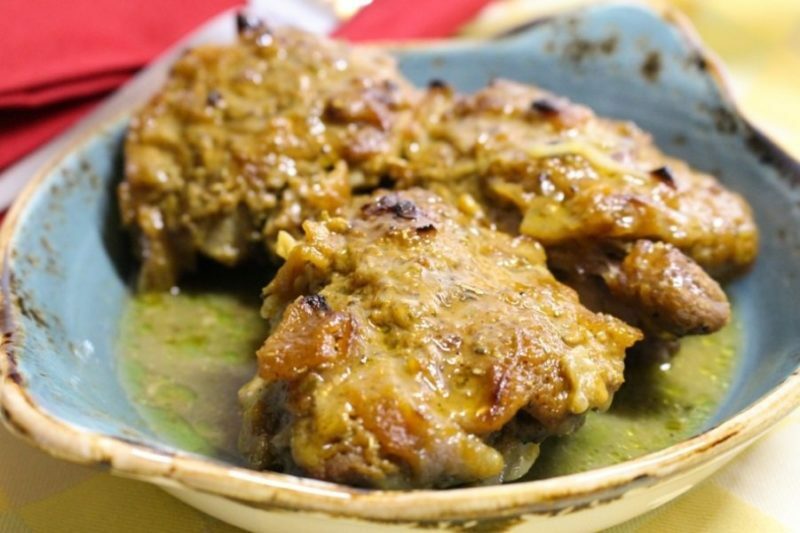 These chicken thighs are one of our most popular easy savory pumpkin recipes. Simply cover chicken thighs in a mixture of lemon juice, olive oil, thyme, shallots and the Pumpkin Honey Mustard then bake. So good. What more can we say? 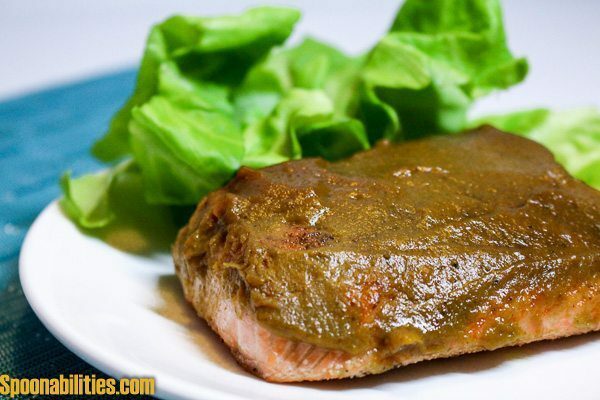 This Salmon with Pumpkin Honey Mustard Glaze recipe is my go-to recipe when I cook salmon because it is so easy to make. The mustard glaze keeps the salmon moist and gives it a hint of fall flavor – and using only one ingredient! You can make this salmon recipe in 15 minutes for a quick but very special weeknight dinner. 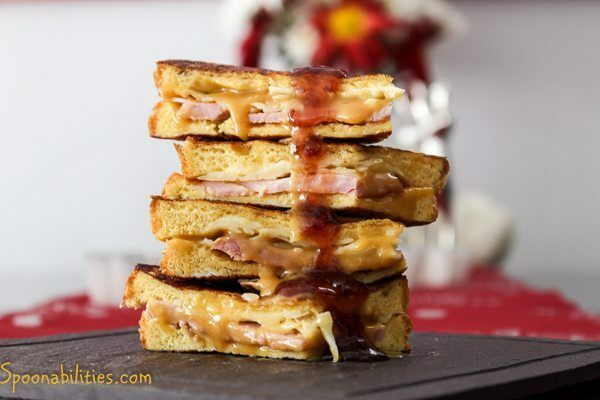 You will definitely want to try this delicious Monte Cristo Sandwich with Pumpkin Honey Mustard. 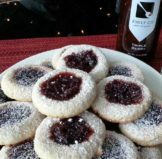 We took this easy savory pumpkin recipe to another level and drizzled on our Triple Berry Jam. We think you’ll love this sandwich any time of year. We do! 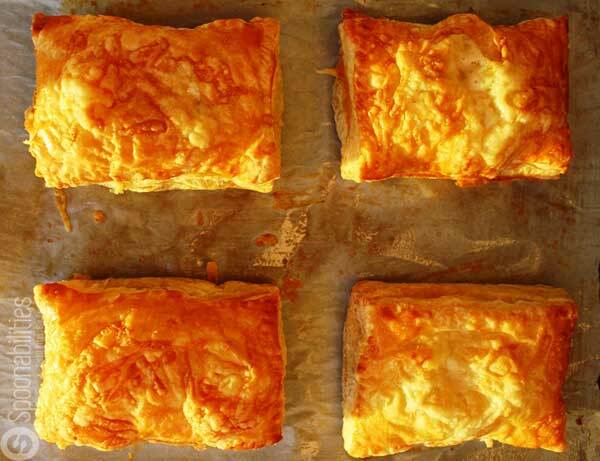 This traditional French Croque Monsieur sandwich had a transformation by using flaky puff pastry filled with creamy Béchamel, which balances the saltiness of the air cured Italian prosciutto, and the creaminess of the Gruyere cheese. 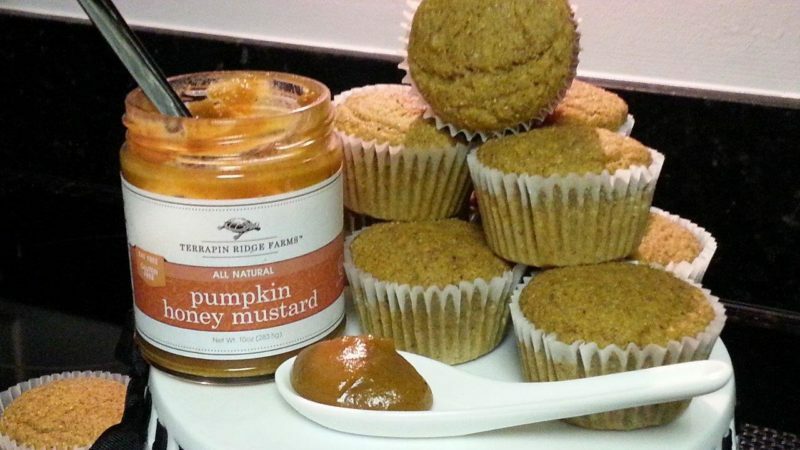 We enhanced this recipe with our Honey Pumpkin Mustard. That adds the perfect sweetness and tanginess, and makes it one of our favorites for our very favorite season: Pumpkin Season. Bring on the corn muffins (with a pumpkin twist of course)! This recipe for Pumpkin Cornbread Muffins will be one of your favorites, especially for family get-togethers this fall. I’m so glad it’s pumpkin season. I am trying to include it in everything right now! Pumpkin season is our favorite time of year too. Let us know what unique dishes you make that include pumpkin. You are very welcome. Thanks for coming by. 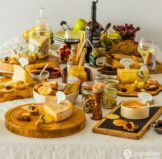 This is great, we always think of sweet foods when we think of pumpkin but there are so many delicious savory foods that can be made with pumpkin. Thanks Dahn. We have plenty of sweet pumpkin recipes here too. Check those out as well. With it being pumpkin season, I will definitely have to give some of these a try! That Monte Cristo sandwich with pumpkin honey mustard looks especially delicious! I need to try all of these pumpkin recipes immediately! YUM! Your pumpkin hummus looks and sounds amazing! Love the pumpkin honey mustard on the Monty Cristo too! Yum Yum! Thanks Katie. Those two that you mentioned are our favorites. We eat the hummus all the time, and we are overdue to make the monte cristo again. Enjoy! These all look so delicious! Can’t wait to make that Autumn Harvest Salad!! Thank you, Sarah! 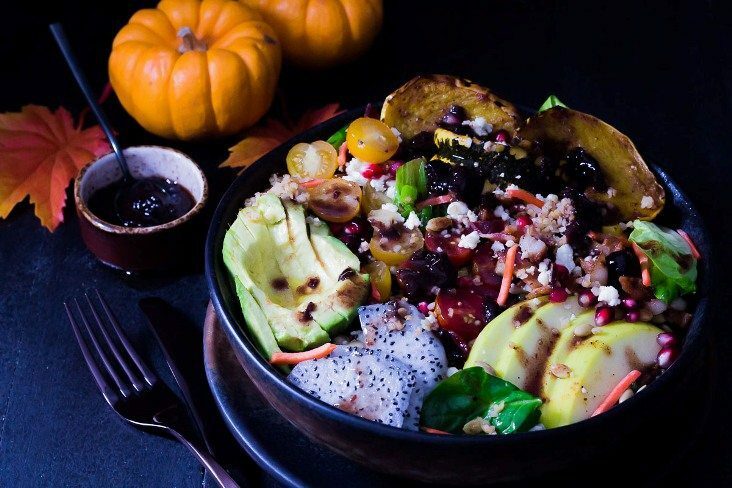 The Autumn salad is Super delicious, and you can substitute some of the ingredients with any fall produce that you have available where you live. The magic is in the dressing! I love using pumpkin in desserts but it’s nice having some savory ideas, too! Thank you, Liz, for stopping by. 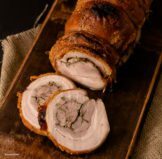 Which recipe will you try? Great ideas for pumpkin! This takes it way beyond the standard pie — I never thought of pumpkin in a salad before. Hi Liz, I always like to take some ingredients and make recipes out of the traditional dishes. Thank you! These look great! I bake with pumpkin all fall long, but don’t do much with it in the savory department. I want to fix that, starting with that delicious-looking Monte Cristo! Monica, I agree with you, you need to fix this asap. Send us a picture when you get to make the Monte Cristo.